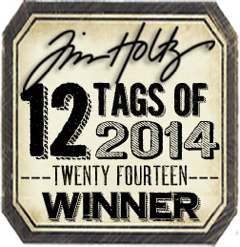 I am excited to be participating in a special blog waltz today. Several of the WMS Design team members are using Waltzingmouse stamps to embellish bags from Pouch Mart - a web store that sells all shapes, colors and sizes of bags. 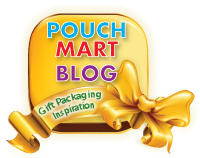 The folks over at Pouch Mart generously sent us some bags to work with and they are also offering a $25 Pouch Mart gift certificate for one lucky commenter. See all the prize details at the bottom of my post. 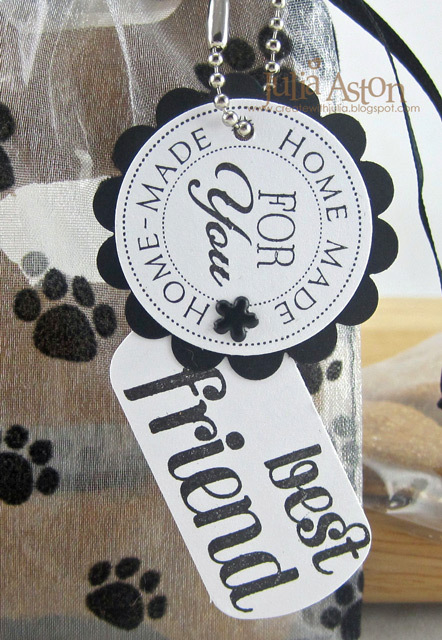 The" home made for you" label is from the Candy Jar Christmas set and the Best Friend is from the Compact Family set. I attached the best friend label to the circle with a little flower brad, punched a hole in the circle label and looped a key chain through that and the drawstring tie on the bag. 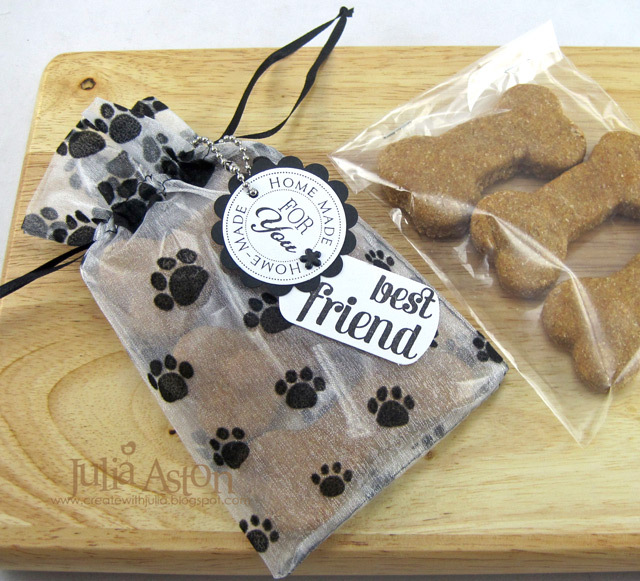 I put the dog cookies inside a clear bag, stapled the top to keep them fresh and placed the bag inside the paw print bag - and ready to go! I'm always looking for cute cookie cutter shapes and this past winter I found these wonderful dog and mouse ones in a shop in Vermont when we were visiting my DH's brother and his wife. 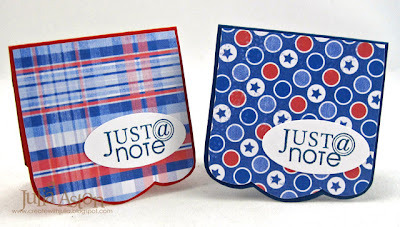 Be sure to leave a comment at each blog - one lucky commenter will win a $25.00 gift certificate to Pouch Mart - and another lucky commenter will win a Waltzingmouse Stamp set! 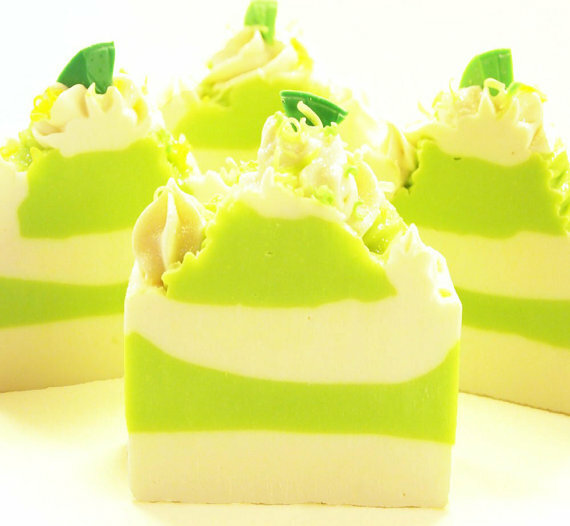 You have until Sunday July 29th 11:59 pm EST to leave your comments! Winners will be announced here on my blog Monday July 30th. 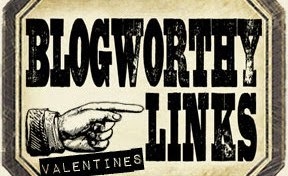 Here are the links! 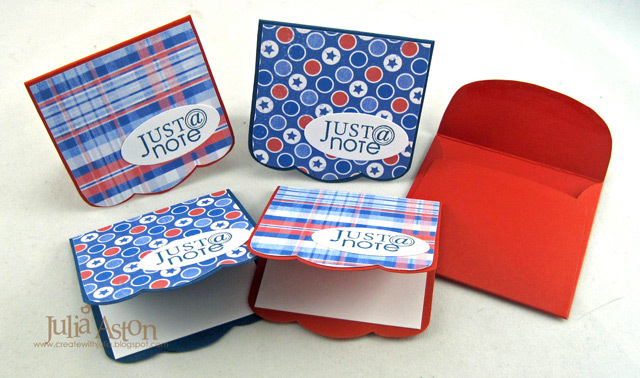 Let's go see what bags each of these designers used for their projects today! Accessories: beaded key chain - Tandy Leather, metallic mini flower brad - Making Memories, Key Tag Punch - SU, 1 1/2" circle punch - EK Success, scallop circle punch - SU, 4x6 paw print pouch - Pouch Mart, dog cookie recipe - bullwrinkle.com. 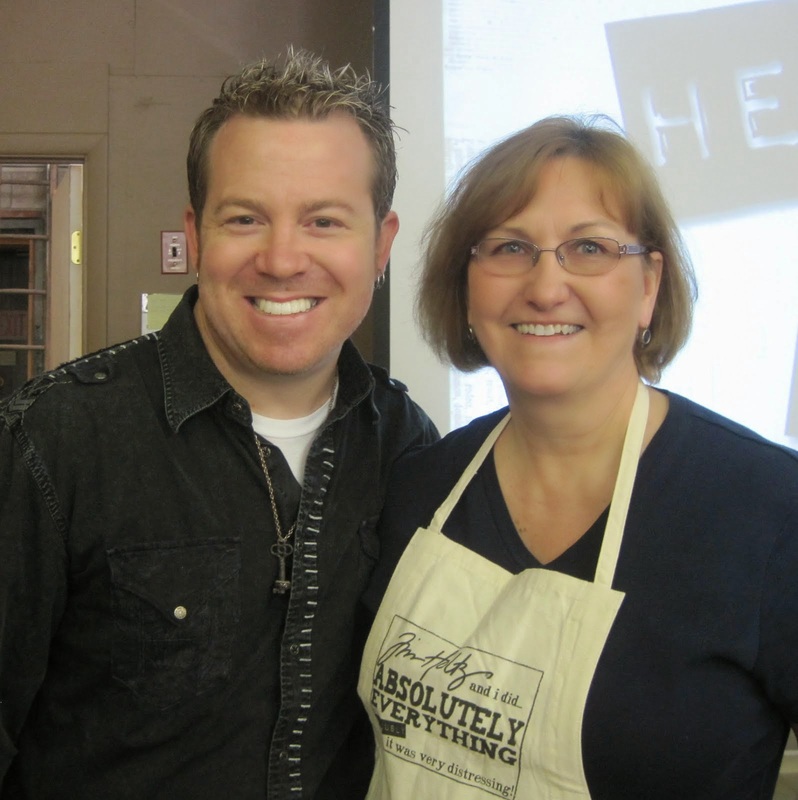 WMS July 17th Blog Party - Celebrate the Outdoors! 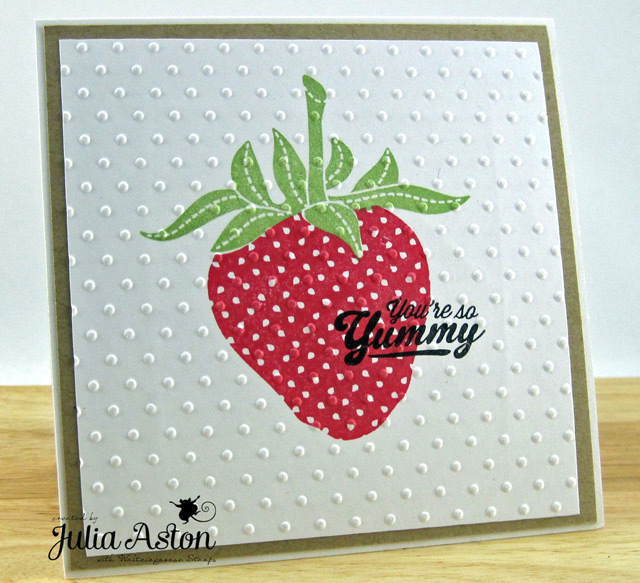 I chose to highlight summer foods - in particular - fresh strawberries and home made jam! I made this sweet little basket with three strawberries inside it from Claire's Strawberry Suite Template (available at the WMS shop later this month) . 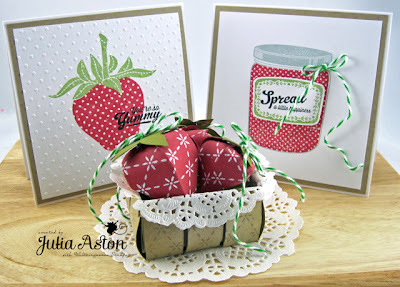 I stamped the sides of the basket and the strawberries with a background stamp from Pin Nic Patterns (I white embossed the stamping on the strawberries). 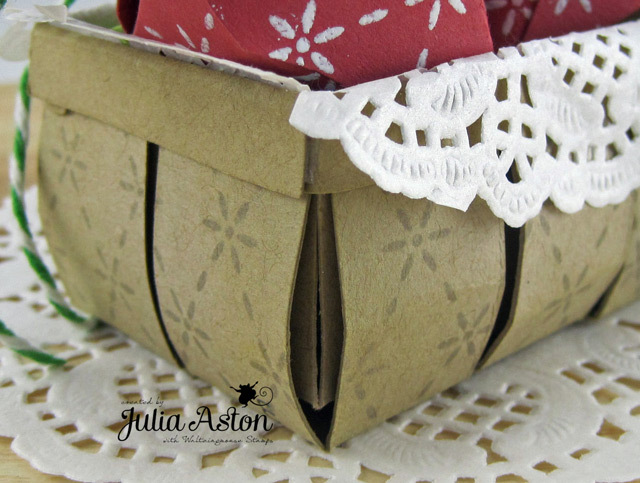 The little basket is about 2 1/2" x 1 3/4". 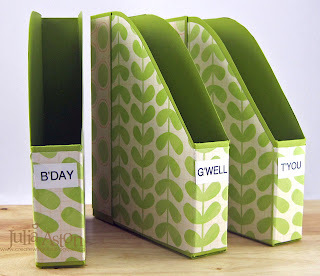 The pattern includes a handle but I didn't use it on mine today. My first card uses stamps from the set Big Berries - Strawberries - you can pre-order this set now! 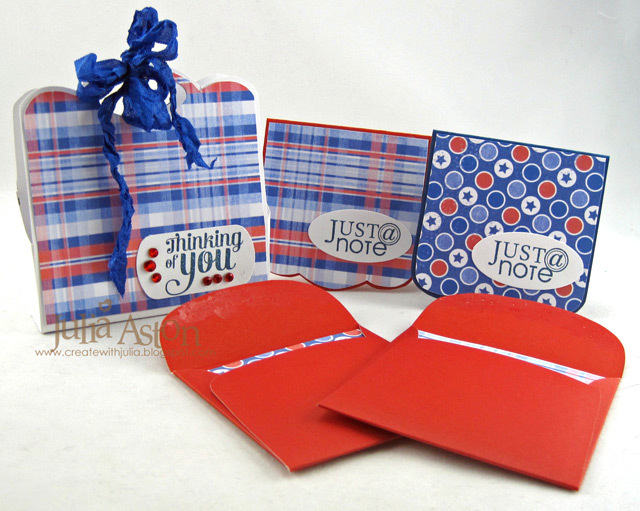 - it will be available mid-July. After stamping all the images on the white panel, I dry embossed it with my Swiss Dots embossing folder. 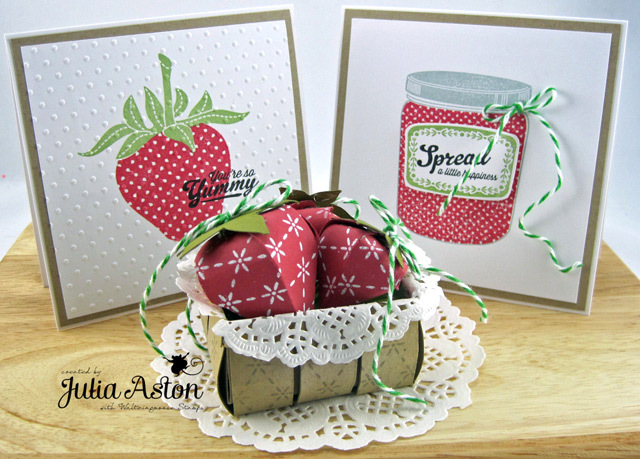 The cards are both 4 1/4" x 4 1/4"
My 2nd card uses stamps from Jar Fillers - Jam Packed and Candy Jar two more sets that will be available NOW! in mid-July. 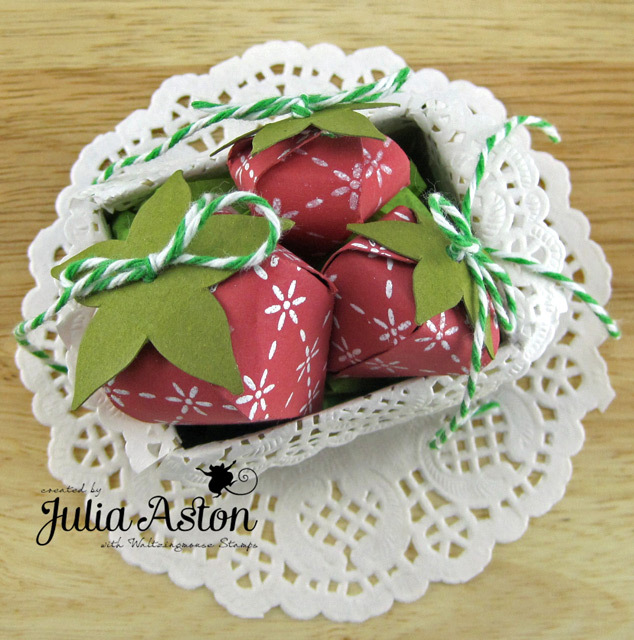 (if you have the Candy Jar Christmas set - you already have this jar!) 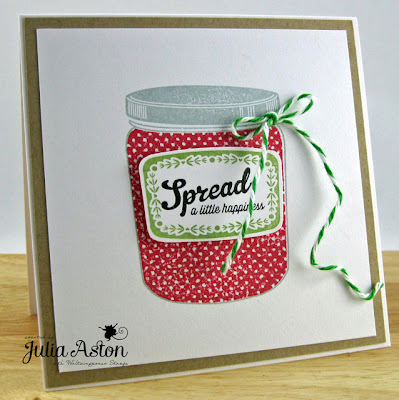 I stamped the jar outline and cover with London Fog ink, then I stamped the contents in red. 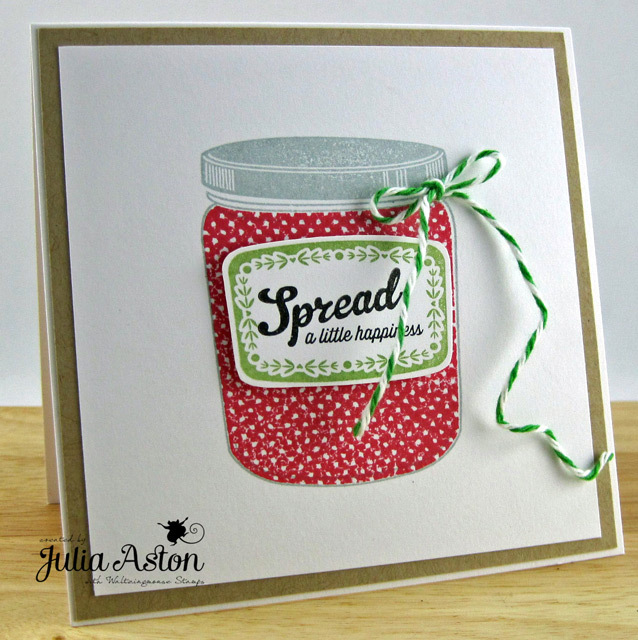 I stamped the label, cut it out and layered it over the jar with foam tape. 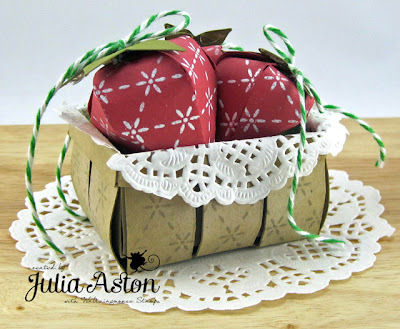 Then I just added a piece of tied twine adhering it with a glue dot. I cut up a paper doily and adhered the edges just inside the edges of the little box and folded them over the top. 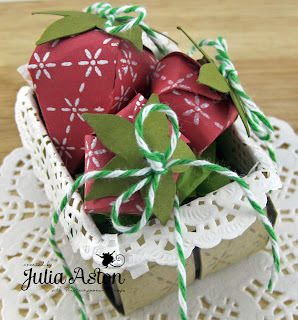 I ran the twine through the holes in the panels of the strawberry to close them up and pulled the twine up through the leaf on top - then tied it in a bow. I placed my little box on top of another doily - Isn't this just the cutest thing??! 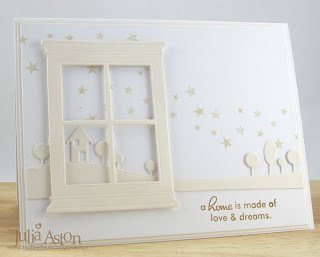 Now I hope you will check out all the people coming to the Blog Party today - we are all linking our cards/projects up over at the WMS blog! I'm off to check them out - are you coming with me?? You can also join in the fun! 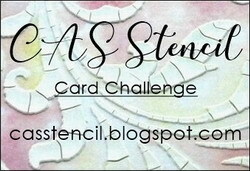 You have 24 hours to post and link your card - all the details are here. Stamps: Waltzingmouse - Pic Nic Patterns, Jar Fillers - Jam Packed, Big Berries - Strawberries, Candy Jar (or Candy Jar Christmas. 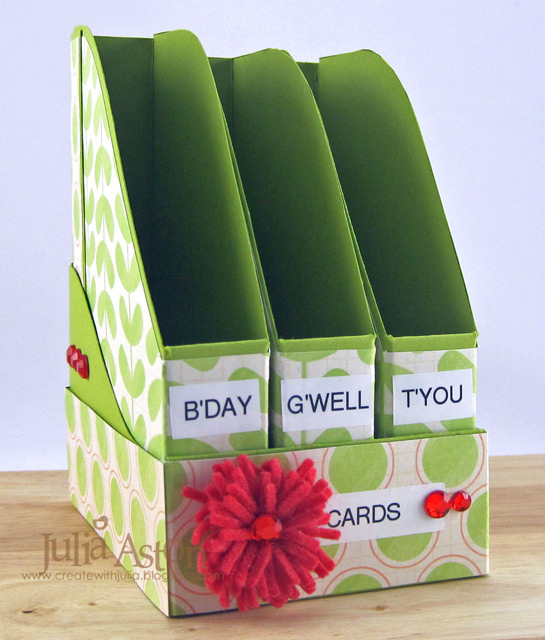 It's always good to have guy cards on hand. 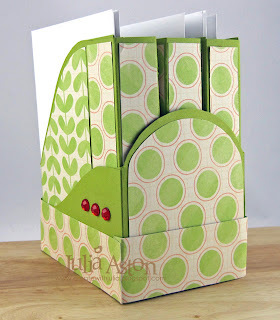 I used a different vehicle image, used a square instead of circle for my image and used different papers. I added a ribbon and a button with bling for good measure!! Cynthia didn't color her image so I left mine uncolored as well. I was tempted to color it in - but decided to leave it Clean and Simple! 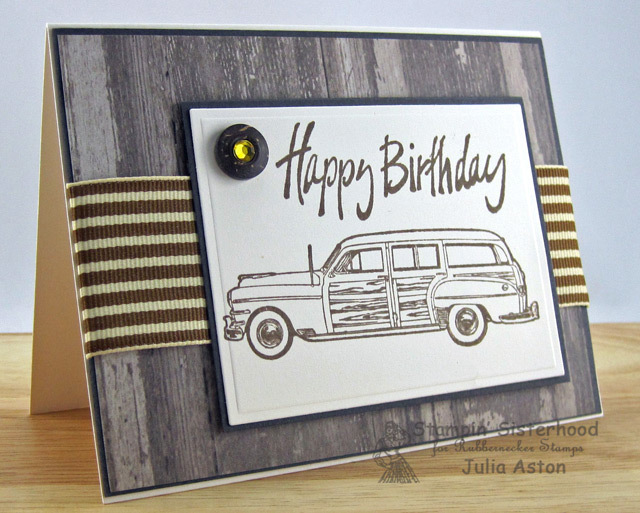 My vintage woody and Happy Birthday are from Rubbernecker Stamps. 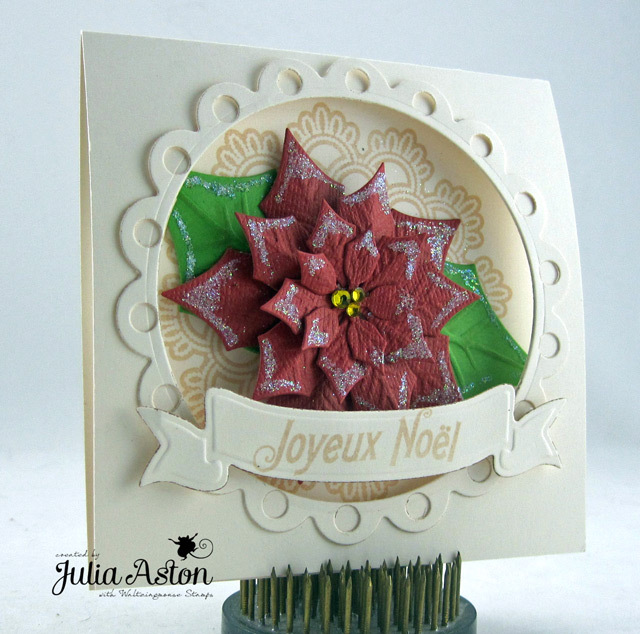 The wood grain paper is from the Country Boutique 6x6 paperpad by Fancy Pants - a recent purchase! I thought it was the perfect background for my 'Woody' wagon! I'm back to work after my time off last week - but am actually happy to be in air-conditioning - this whole week is supposed to be HOT AND HUMID!! 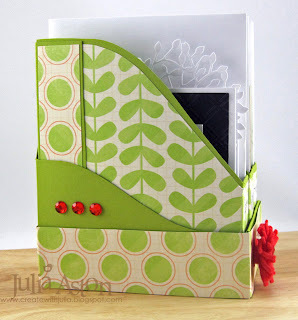 I'll be back tomorrow to participate in the July Waltzingmouse Blog Party - will you join in as well?! You can find all the details here. 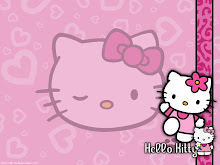 Happy Saturday everyone! 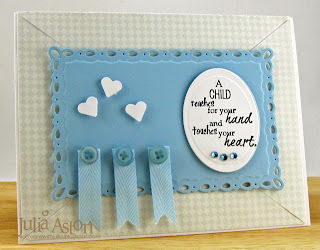 Here's my card for the inspiration challenge over on Splitcoast today. 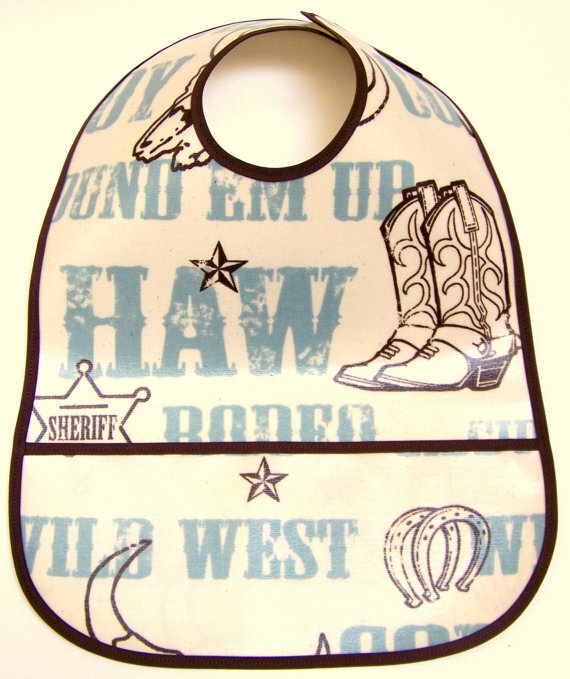 The inspiration web site was the Sugar Chic Baby Etsy Shop - I was inspired by this cowboy bib. 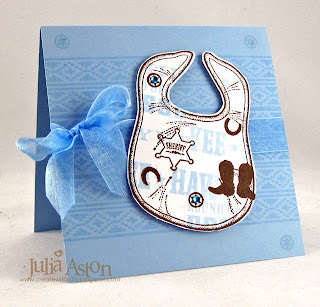 I recently purchased this fun little bib stamp by Toomuchfun Rubberstamps at a scrapping/stamping show and this was the perfect opportunity to use it! The stampings on the bib and background are from Back in the Saddle and Way Out West by Waltzingmouse. 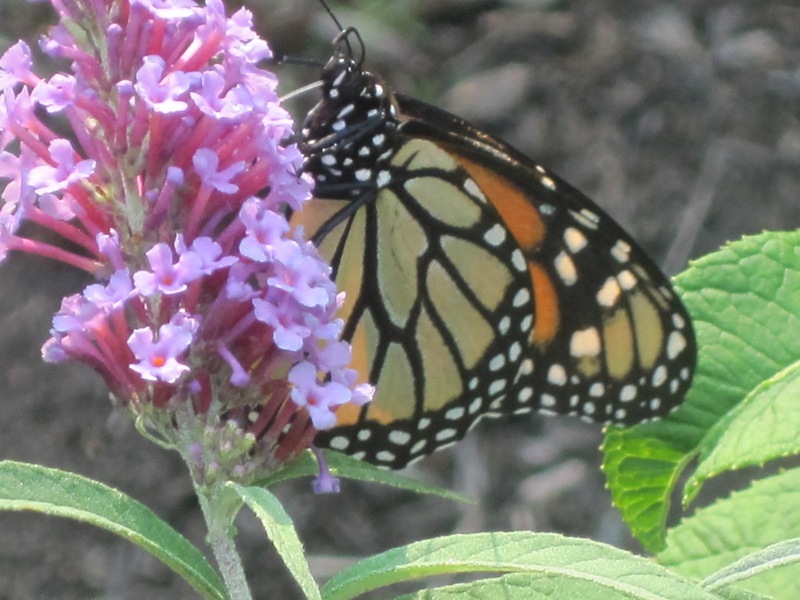 Before I go - I just wanted to share a picture I took in my garden today - this wonderful monarch butterfly was fluttering around my butterfly bush (planted specifically to attract these beauties!) - she wouldn't open her wings for me so you can just catch a glimpse of the lovely orange. A 2 Year Old and a Fisherman! 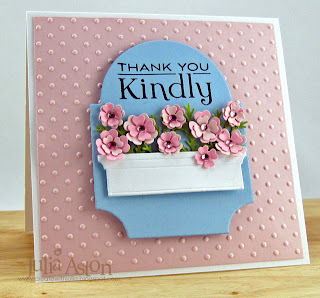 Loll Thompson was the Featured Stamper over on Split Coast last week and I chose her Drew is 2 card to CASE. My grandnephew, Landon, will be 2 in Sept - and I just loved Loll's card with the torn rolling hills and fun truck! 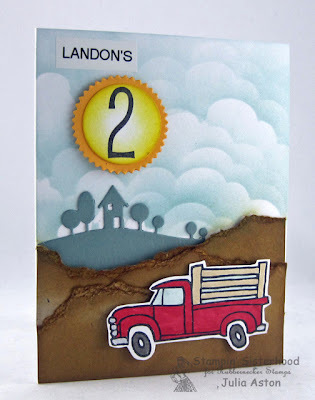 I used a pickup truck from Rubbernecker and added a house and trees to the landscape using my Memory Box die. I also sponged clouds, using a template from Inky Antics, rather then using die cut ones. And I added a sun with the #2 in it from the Pub Cat Alphabet Set. I used my P-touch label maker for Landon's name. 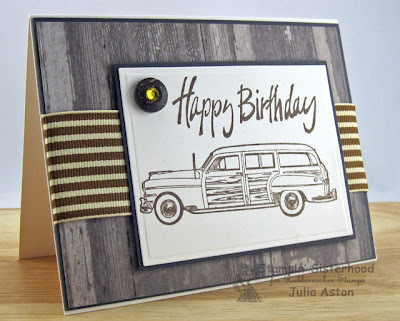 First I cased this great masculine Truckload of Birthday Wishes card of Debbie's our Featured Stamper this past Sunday. I used a different image, made a slightly smaller card, added a sentiment and adhered my oval at an angle. And I was also able to work it into Tueday's Teapot Challenge - A Man of the Woods - one of the options was to use anything to do with Fishing. 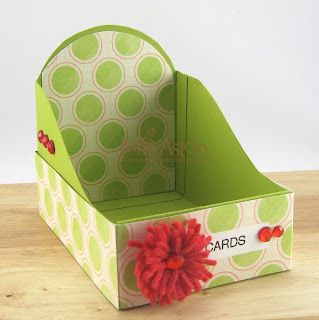 Our cards this week will go to Heath - a young man seriously injured in an industrial accident who could use some happy mail to help keep his spirits up! 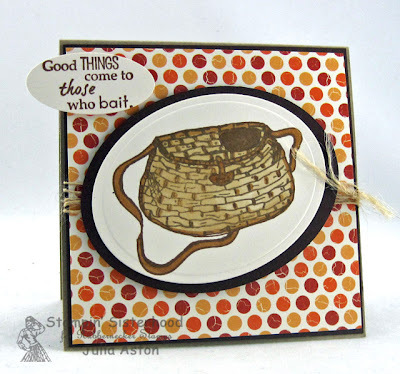 I love this Rubbernecker sentiment that goes so well with the fishing basket (a creel, I've been informed!). 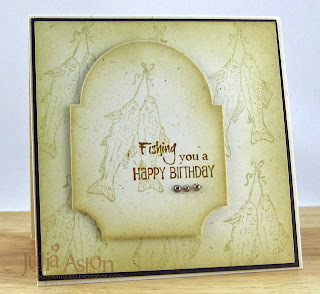 Perfect for Heath the fisherman I thought. And inside I stamped a verse from 1 Peter - Cast your cares upon him for he cares for you. 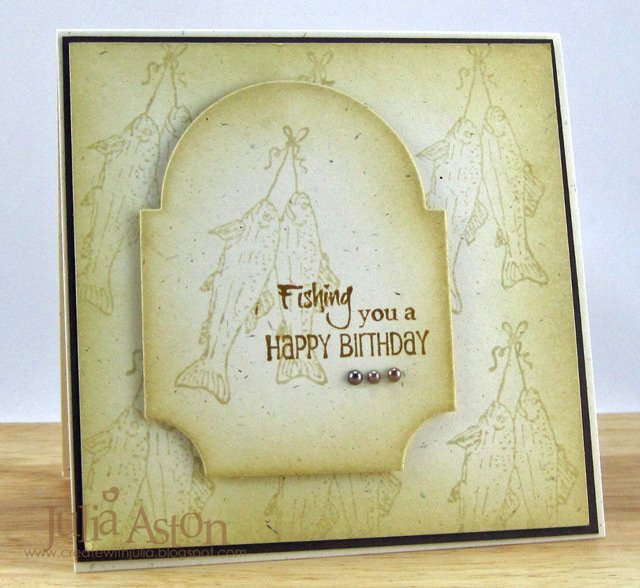 Yikes - another, kind of, fishing reference! The Waltzingmouse Forum has a monthly Christmas Card Challenge posted in the Playroom - the new challenge is posted on the 10th of each month - so July's was just put up - and it's to use ORANGE on your card! 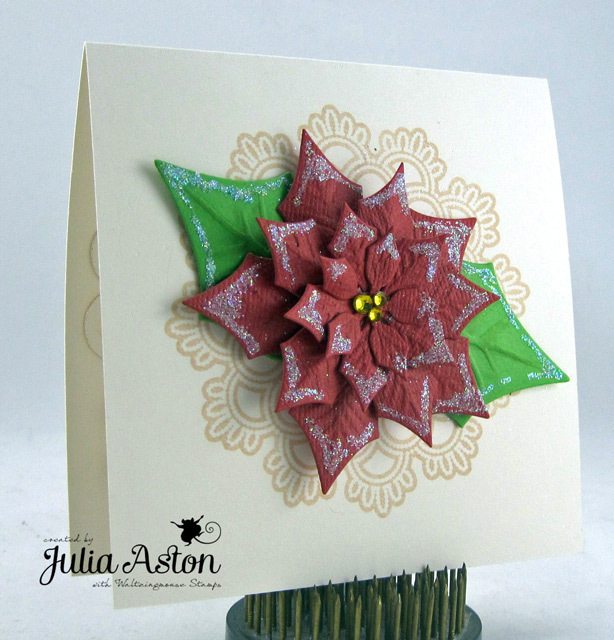 Certainly a very non-traditional color for Christmas! 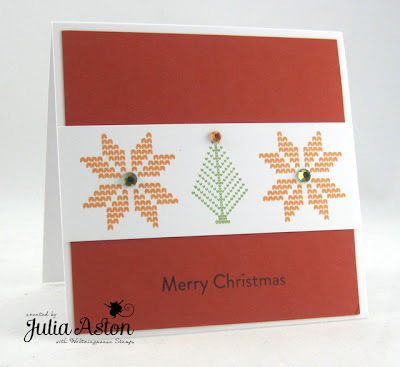 I used the Waltzingmouse Nordic Winter stamp set for my cards this month - a set with some wonderful single stamps as well as several background/border stamps - all in the pretty cross stitch style! 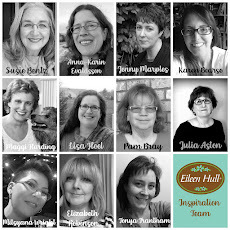 So how about joining us each month??!! Check it out in the Playroom of the WMS forum! 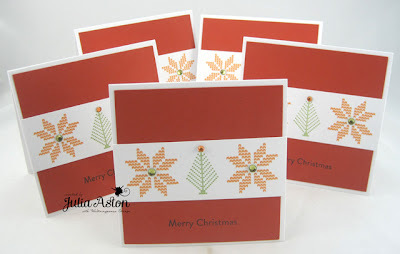 Hi Stamping friends! 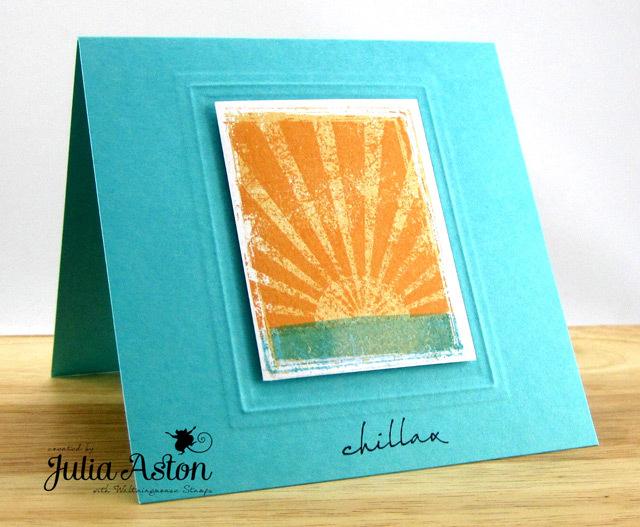 I have two cards to share with you today. Both made for Split Coast Stampers challenges. I combined this challenge with the Queen For The Day - Angela Maine is the Queen this week - I CASED her lovely Get Well Butterfly card. I used a text stamp on the strip for the July Cas-ual Fridays challenge - to use text on your CAS card. 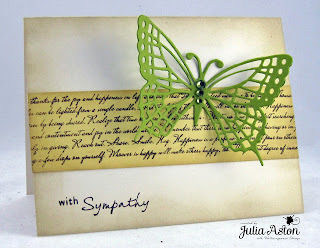 The beautiful butterfly die is from Marianne. 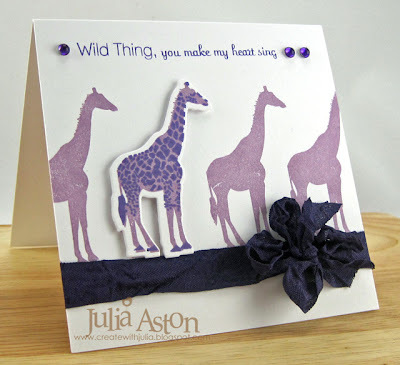 The text and sentiment stamps are from Waltzingmouse. 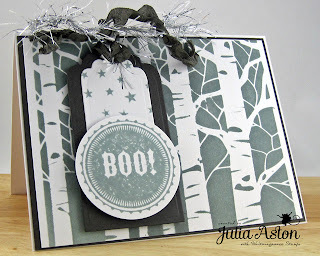 I sponged all the edges with Ranger Distress Old Paper ink. My second card is a little more upbeat and happy! 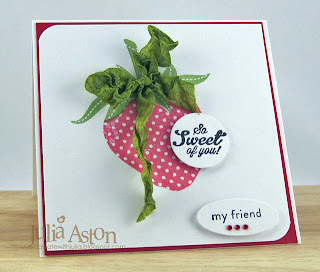 I made this card for last week's color challenge on Split Coast. Vicki's colors for us were white, crumb cake and coral. I dry embossed a square Nestability in the center of the card and wrapped the satin dotted ribbon around the middle. 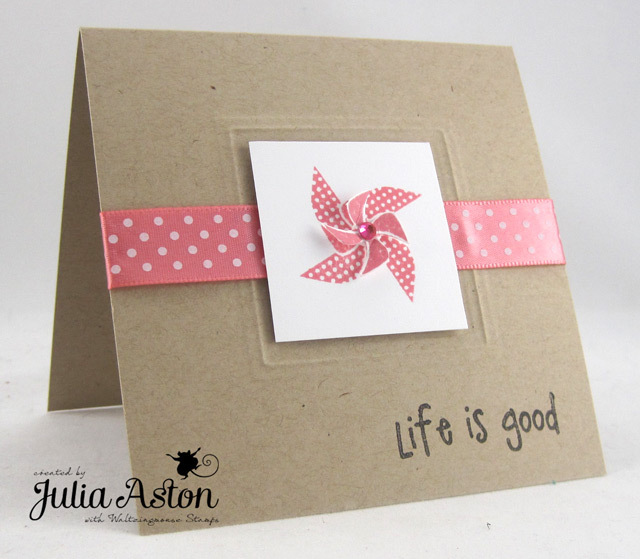 Then I stamped my little pinwheel on a white square. I stamped the pinwheel again and cut out the smaller center piece adhering that over the first stamping with a foam dot so it sort of looks like the pinwheel is spinning! I added a rhinestone to the center. 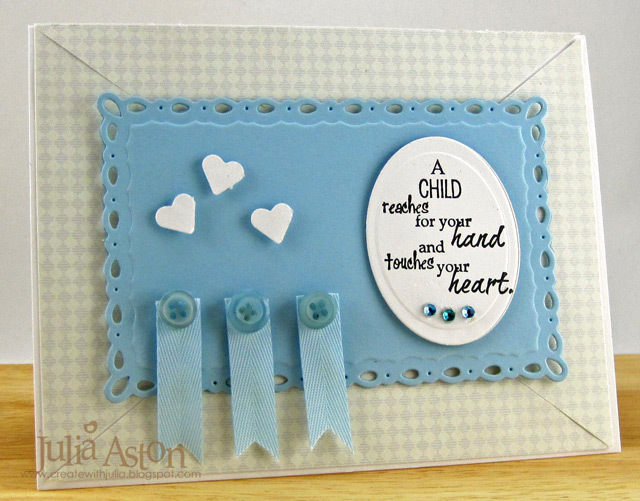 I adhered the stamped square inside the embossed square with foam tape and stamped the sentiment in the corner! Well - I'm off to take my car for an oil change and tire rotation - then I'll be enjoying this beautiful summer's day weeding in the garden! 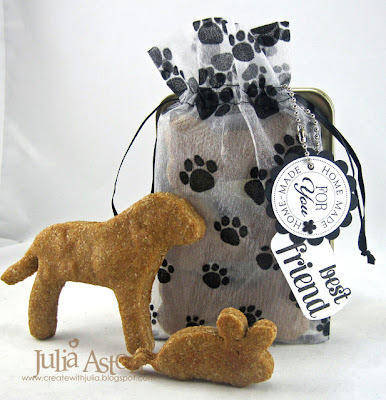 Dressing up the Jute Bags!